October - what a wonderful month! I love the colors that appear every day! A patchwork quilt that God sends our way! The Des Moines AQS show! This show connects us with old and new friends. It’s close to home and we can sleep in our own beds! Really, that’s important! International Quilt Festival in Houston, Texas! Last month we shared with you our new “Just Dance” panel. It was ready during the Des Moines show and many of you were able to purchase it. Thank you for all of your positive comments! If you missed it at Des Moines, you will be able to order it on-line soon! 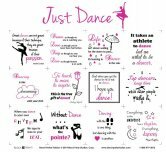 This panel can be used for any age or style of dancer. This panel can be used with this panel or any of our “charm-square” friendly panels. Have you seen our tattoo? “Born To Quilt” has now been printed on a white t-shirt and a large ceramic travel mug. The “Born To Quilt” t-shirt in 100% cotton with 3 colors printed on white. We will send one tattoo with any "Born To Quilt" T-Shirt purchase. The “Born To Quilt” travel mug has the same design printed on two sides of the mug, along with a flexible lid. I love my mug! It holds a lot of coffee, and that’s always a good thing! So many of you stop at our booth and laugh and laugh. We love all that laughter so we are designing a couple of laugh filled panels just so we can hear your laughter! We will preview them at Quilt Market and Quilt Festival, and will have them ready for you in November. Keep an eye open on the web-site, and I promise I’ll have them here for you to see next month! Stop in the shop when you are in the area. The Farmer’s Almanac predicts another long and cold winter, so come in and load up on our panels and fabrics. If winter is anything like last year, you will need plenty to keep you busy and warm! Enjoy your fall and Happy Halloween!